The end of my work week concluded with a three hour meeting concerning the site preparation and construction issues for a new display building for a local museum. My role, like many such projects I have been part of over the years, was to consider the feasibility of something other than the sequencing of the work described by the very capable contractors engaged to do this project. Rather it was about the ability of the organization to raise the funds needed to pay for everything. And while scribbling notes as I listened to the presentation I could not help but reflect on the fact that twenty years ago I sat in the same room and listened to a similar proposal requiring a capital campaign to make everyone’s dreams come true. People who know me will not be surprised to learn that the new and the old projects are for the Mid-Continent Railway Museum in North Freedom, WI. 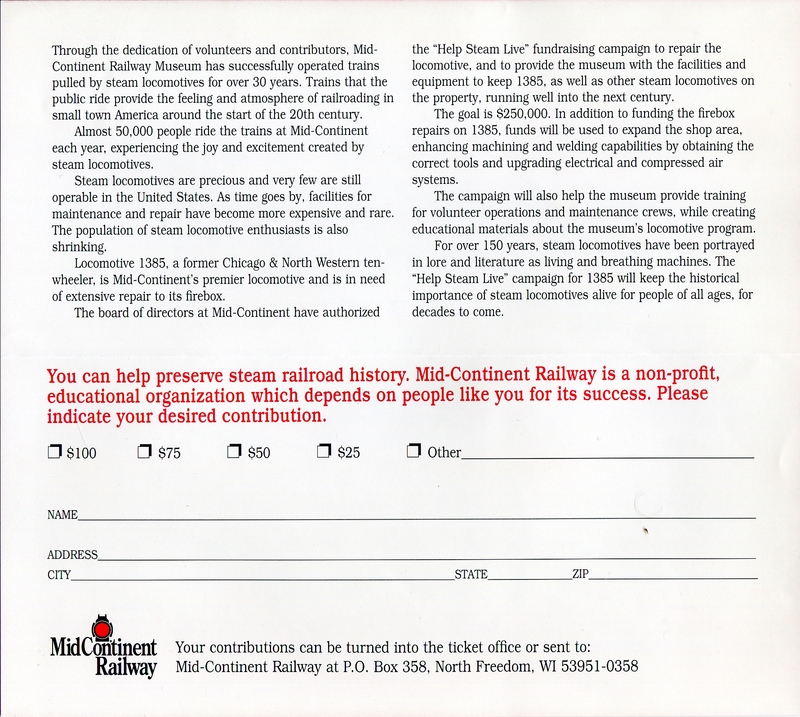 Nor will there be much surprise in the fact that the very first fund raising campaign I did for Mid-Continent, and the first of my career, was to raise money for what we thought then to be the repair of the Chicago & North Western steam locomotive No. 1385. Now we know that the repair was a full-blown restoration project in disguise, which is still a work in process. For a peek at what is taking place just follow the link to Mid-Continent’s Steam Status page or come out to the open house at Spec Machine in Middleton, February 20 and 21 for a first-hand look at what a repair can become when you decide to do the job right. My first campaign was an education in more than restoring an historic artifact. It was a trial by fire in the ways of development that I had only previously observed taking place at other non-profits, where I was the bean counter and my colleagues were the ones courting the prospective donors. I knew, or thought I knew, the routine comprising their work and could talk a good talk outlining the steps to take in establishing and reaching a fund raising goal on the scale of what we term a capital campaign. Outlining and doing are two different things, though, as I came to appreciate by participating in what came to be known as the Help Steam Live campaign. I was a member of the original campaign committee by virtue of being the new general manager, but my duties then did not include fund raising. That function was handled by a board member, who also functioned as the museum’s development director. He worked with an advertising agency we had on retainer and together they came up with the campaign title and fund raising strategy. 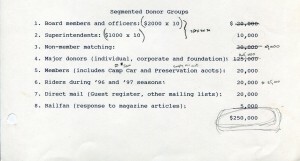 This included the creation of a campaign brochure encouraging people to give in amounts strategically shown on the brochure in keeping with the accepted wisdom for how to elicit donations at the highest possible amount. The campaign committee did everything according to Hoyle, if that erudite gentleman had been interested in donor development instead of laying out rules for gaming. Although gaming may be exactly what we were doing since after one year’s hard work of planning and preparation, the bank account holding our restricted donations for the Help Steam Live campaign represented less than 10% of the fund raising goal as compared to the 50% we had scheduled in our timeline. And with that dismal result, people were starting to disassociate themselves from what they viewed as another museum failure where fund raising was concerned. Being new, being naive and being frustratingly limited in the scope of my responsibilities as general manager, I asked the museum’s president if I could take over the campaign, which I did, in keeping with those guidelines I had witnessed in my prior work experience. In due time we reached our goal. Hooray me! But let me now go back and stress that point about being naïve. We succeeded despite my ignorance. 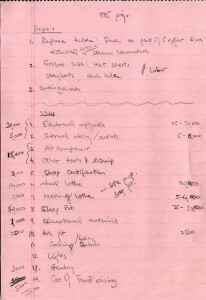 What I learned then, and there was plenty for me to learn, has guided all of my subsequent fund raising efforts. And here are a couple of takeaways I am glad to share free of charge to anyone who has found themselves in the terrifying position I was in twenty years ago. First, capital projects never cost what you think they will. They cost more, a whole lot more, which means the campaign goal will need to be higher as well, like it or not. 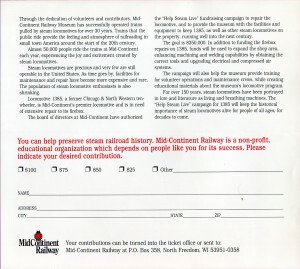 The original fund raising goal for the Help Steam Live campaign was $100,000, which at the time was more than double the museum’s best year in fund raising. But it was not enough to do what needed to be done to return the steam locomotive to operating condition. I found that out after sitting through a few more meetings and even donning coveralls in order to climb in the locomotive’s firebox to get first-hand knowledge of the repairs the shop crew planned to make. By the time I was done getting up close and personal with the mechanical beast the goal had increased to $250,000. This is the fund raising goal we attained. But even that proved to be insufficient once the work began and the hidden areas of a steam locomotive came to light, revealing damage that we did not know even existed. Hence a much revised and still in process restoration game plan. 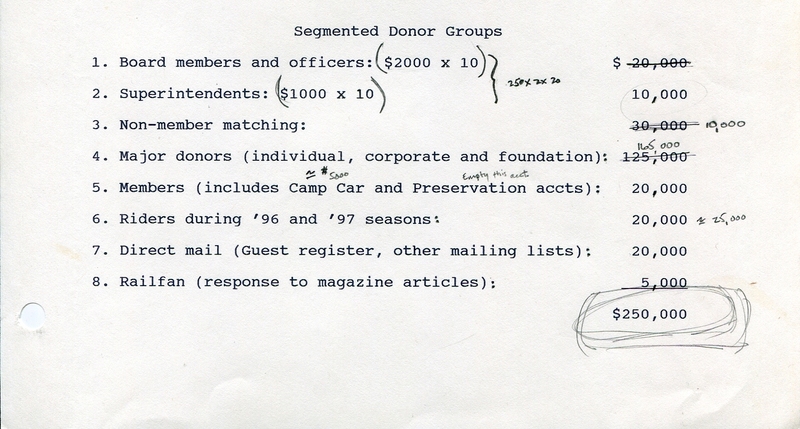 Second, the majority of the campaign gifts you receive will not come from the sources you so ardently planned for. 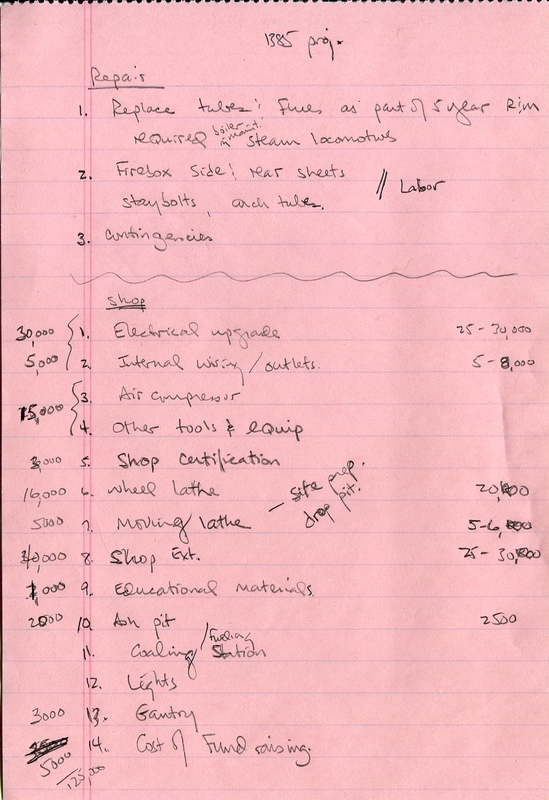 I had dutifully researched the museum’s best potential sources of revenue and distributed to the board of directors a segmented list showing my best guess at the amount each segment would produce. It is shown here along with my penciled corrections after meeting with the directors, some of whom turned hostile and declined to seek re-election the following year. Their gripe: I was expecting them to “buy” their director’s seat by asking them to donate to the campaign. I have learned over the years that very few people who desire, even demand, to make decisions are willing to personally finance those decisions. In last week’s meeting about the new building I took notes, asked questions, and bumped up the estimated cost of the capital campaign significantly. Fortunately another member of the committee was cognizant of the fact that as we talked we identified items not included in the purview of the contractors that still needed to be addressed and paid for by the museum. We’ll see if my guesses this late in my career show any signs of wise council in another, and perhaps my last, campaign. This entry was posted in Uncategorized on January 23, 2016 by Don Meyer.